Mutant X will begin its third season in syndication the week of Sept. 29 with the episode "Into the Moonless Night." Other upcoming episodes include "Wages of Sin" the week of Oct. 6, "The Breed" the week of Oct. 13, "Where Evil Dwells" the week of Oct. 20 and "The Taking of Crows" the week of Oct. 27. Sources have told The Continuum it's possible the show will be broadcast in the letterbox format in the third season. Karen Cliche will join the cast this season; Lauren Lee Smith has left and John Shea will be a recurring guest-star. Look for Mutant X images and more news soon here in The Continuum. X23 returns in "Target X," the new episode of X-Men: Evolution scheduled to air on Saturday, Sept. 13 on Kids' WB!. The episode will also feature X-Men: Evolution in its new time period of 11:30 a.m. (ET). Static Shock is going on hiatus, but will return for a fourth season. The episode is written by Craig Kyle, who created X23, and Chris Yost. "X23 thought by destroying Wolverine she could free herself from the life she was forced to live. She was wrong," Kyle told The Continuum in describing the episode. "Now the ones who made her have come to take their property back!" Look for more X-Men: Evolution news soon here in The Continuum. 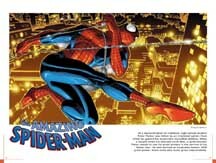 The Art of Marvel Comics Vol. 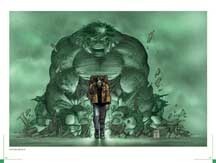 1 Hardcover collection, the first in a new series of Art of� volumes from Marvel Comics, will go on sale on Nov. 5. The 128-page book will cost $29.99. 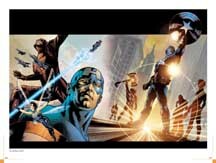 The book features Marvel art from the past two years. Contributors include: Kaare Andrews, Mark Bagley, Julie Bell, Tim Bradstreet, J. Scott Campbell, John Cassaday, Richard Corben, ChrisCross, Gabriele Dell'Otto, Vince Evans, David Finch, Bryan Hitch, Greg Horn, Stuart Immonen, Richard Isanove, J.G. Jones, Joe Jusko, Dale Keown, Sam Kieth, Adam Kubert, Andy Kubert, Bob Larkin, Salvador Larroca, Jae Lee, Joseph Michael Linsner, David Mack, Alex Maleev, Tom Marvelli, Josh Middleton, Rudolfo Migliari, Glen Orbick, Joe Quesada, Frank Quitely, Esad Ribic, John Romita Jr., Alex Ross, Steve Rude, Tim Sale, Bill Sienkiewicz, Mark Texeira, Matt Wagner, Lee Weeks and Mike Wieringo. "All of the early comic books I purchased as a young kid were Marvel comics," said contributing artist Campbell. "All of the artists that influenced me the most have been Marvel artists. After being in the business now for about ten years, it's been a real childhood realization and pure blast to have been able to draw Spider-Man and play even just a small part in this icon's history." Click on the thumbnails for larger images from the book. Dreamwave Production has provided The Continuum with a preview of Transformers: The War Within V.2 The Dark Ages, which launches in October. 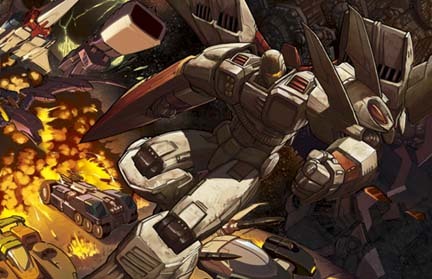 The sequel to The War Within is written by Simon Furman, with art by Andrew Wildman, and tells the story of the Great War between the Autobots and the Decepticons. 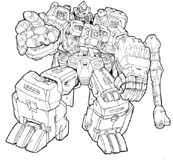 Furman has a long history with Transformers but has always had a special interest in the world of Cybertron. "I thought that there is a whole wealth of stories to tell which sets up a kind of bedrock for their new, slightly realigned universe," he said. Pat Lee, president of Dreamwave Productions said, "The War Within V.2 The Dark Ages is going to be an extremely exciting book with new designs by myself and Don Figueroa. It was crucial for us to make Transformers fans feel that they are going to be part of a great historical event in the Transformers timeline and bring them a story that has never been told before." Shown above and below are two covers, a concept design of The Fallen by Lee and four never-before-seen character designs. Click on the images for larger views. For DC's Superman panel, CLICK HERE. For Top Cow's Witchblade panel, CLICK HERE. For DC's Vertigo panel, CLICK HERE. For Marvel's Ultimate panel, CLICK HERE. For Marvel's X-Men panel, CLICK HERE. For DC's DC Universe panel, CLICK HERE. For the Aspen panel, CLICK HERE. For the Marvel panel, CLICK HERE. For the WildStorm panel, CLICK HERE. Dynamic Forces is releasing The Uncanny X-Men Anniversary Lithograph by Joe Quesada in November. The lithograph features characters from four decades, including Marvel Girl, Cyclops, Iceman, Beast and Angel from the 1960s; Havok, Polaris, the Mimic, Sunfire, Longshot, Dark Phoenix, Nightcrawler, Banshee, Dazzler and Longshot from the 1970s and 1980s; and Archangel, Wolverine, Jubilee, Gambit, Bishop, Phoenix and Cyclops from the 1990s. The lithograph measures 18 inches by 24 inches and is printed on archival 80lbs. Stock. The lithograph will cost $19.99. Coming Tuesday: Movie news -- and much more!! !